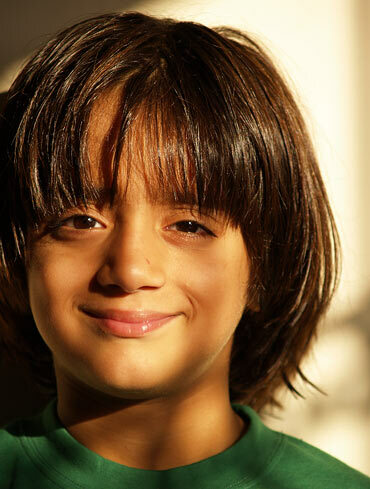 We're talking about Armaan Verma, who plays Shah Rukh Khan's son in Ra.One. The 12-year-old gave Sonil Dedhia a sneak peek in one of the biggest releases of the year, while also talking about his equation with the superstar, Salman Khan, and why he likes villians better than heroes. How were you approached for Ra.One? I had done a few commercials and always wanted to act. Lina Ashar, the founder-director of my school, is also a friend of my mother. She knew I was interested in acting, so one day she called my mother and told her to get in touch with Shanu, who is the casting director of Ra.One. We went and met her and I gave around three to four rounds of auditions, where I had to do a little bit of action and dance. After that I went to Shah Rukh Khan's house to meet him and give my final audition. Finally, I was signed for the movie. I have done a few commercials but have never done a film. I also attended the Ekjute Summer Workshop and the Young Talent group. You get to go to new places, you get to learn a lot of new things and meet new people. I think acting is fun. I play the character of Prateek Subramaniam who is in the school rock band and plays for the school football team, and loves to skateboard. Video games is his first love and he is capable of playing even the most difficult games with ease. He loves villains and feels that heroes are boring and predictable. 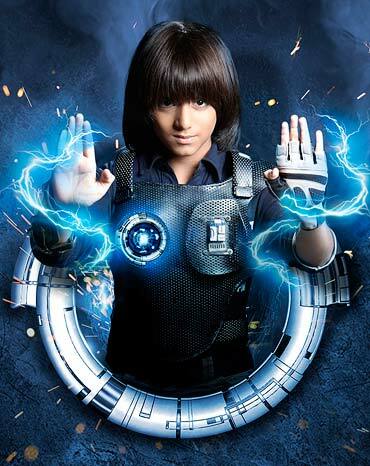 The film is focused around a father-son relationship where my father Shekar Subramanium (Shah Rukh Khan), a Tamil scientist, creates the superhero Ra.One for a computer game that he programmes for me. In the film I don't get along with my father as he is too nerdy and I'm embarrassed by my loud Punjabi mother (Kareena Kapoor). What did you learn from the film? I learnt a lot of things. I had to learn Capoeira, a martial arts dance form practised in Brazil. As it is a superhero film, there were a lot of special effects. I had to do a lot of stunts and enjoyed doing them. Do you recall any funny incident during the shoot? The best part was when they would put me in a harness and I would fly in the air from one place to another. Actually there is a sequence where I jump from the balcony with my skateboard and land on the road. When the shot was done, the technicians pulled me two floors up in the air and were swinging me. It was real fun. Were you not scared of doing the stunts? No, I was not scared, as the crew was always there to help me. There were also a lot of safety precautions like harness and ropes so I didn't have any problems. How was it working with Shah Rukh Khan? This is not the first time I've met him. Salman Khan's nephew Ayaan Agnihotri is a very good friend of mine. He had called me to the premier of Salman's film Partner and that's where I met Shah Rukh for the first time. Shah Rukh is very entertaining. As I want to become an actor, he taught me a lot of things. He told me to be a good supporting actor because you need to support your co-stars even if you are not doing in a particular shot. How long did you shoot for Ra.One? The shooting went on for a year-and-a-half. I shot for the movie for a year and for the rest of the six months there were little things that needed some time from me. How do you manage your studies? I am not bad at studies. I am really good. I had to miss school for a month when I had to go to London for the shoot. I had a tutor at home who helped me with my studies and my school accommodated some extra classes that helped me a lot. Also, my friends in school are very helpful and they would keep me updated with whatever was being taught. Are you treated as a star-kid in school? No, I am treated like other normal kids. They are happy for me when they see me on television. My friends didn't know that I was shooting for Ra.One till about 80 per cent of the shoot was complete. Do you feel like a star? No, I am very normal. Who do you like more, G.One or Ra.One? I always prefer Ra.One over G.One. I have never liked good characters. With Spiderman I prefer Venom, with Batman I prefer the Joker, he is much cooler. Villains are much better than heroes. Villains are always shown in red colour and in our film Ra.One, he will be shown wearing a hood which looks really awesome. Heroes are good people and they always follow the law and go by the rulebook. Villains do whatever they want to do (Laughs). 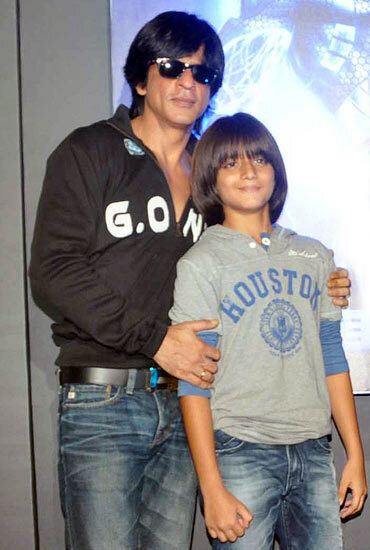 Does Shah Rukh know that you like Ra.One more than G.One? Yes, and I guess even he likes Ra.One more than G.One. So, when you become big you would want to become a villain? I don't want to become a villain but I like them. When I grow up, I would like to be someone like Shah Rukh Khan. Who are your favourite superheroes? I like Ironman, Spiderman, Hulk, Captain America and Wolverine. Who do you like more, Shah Rukh Khan or Salman Khan? Acting wise I like Shah Rukh Khan, and personally I like them both. I have known Salman since the time I was four years old. I have gone with him to his farmhouse. He calls me a kida because I do a lot of kidagiri. Which are your favourite Shah Rukh Khan films? I like Om Shanti Om, Kabhi Khushi Kabhie Gham and Kal Ho Naa Ho. Which are your favourite Salman Khan films? I like him in Wanted and Bodyguard. Which actors do you like? Among actresses, I like Katrina Kaif, Priyanka Chopra and Kareena Kapoor. Apart from acting, what interests you? I like drawing and I like playing football and I also watch it. My favourite football teams are Manchester United and Barcelona. Has Ra.One already recovered all its money? Guess where RA.One's appearing next!